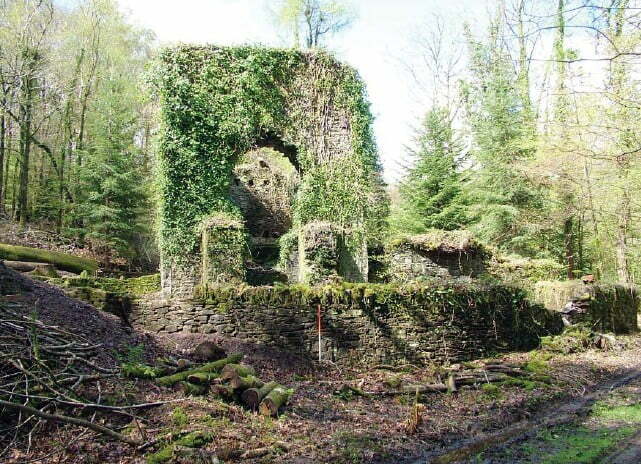 Brookwood Mine is an old Copper Mine on the Edge of Dartmoor. The combined mines were the largest copper producers in this part of Devon (between 1856 and 1885). Brookwood Mine was originally worked as 2 individual mines (Wheal Emma and Brookwood Mine) and then jointly as South Devon United Mine. The area also includes East Brookwood Mine and Newbrook Wood Mine. During the main period of prosperity 1866 -1877 the two mines produced a total 34,000 tons of copper ore. In 1858 a new 50 by 5 foot water wheel was ordered. By this time the flow of water through the original leat from the Mardle was insufficient to drive all the various wheels. Arrangements were made with the Duchy to obtain additional supplies by constructing a new 12 mile leat from a point on the Swincombe River, near Whiteworks Mine. This constituted the longest artificial water-course on record in the west of England! In 1862 Wheal Emma was employing 125 people and six years later reached a depth of 116 fathoms below adit (18 fathoms). The mine was drained by the 50 by 5 foot wheel, but hoisting and crushing was carried out by two other wheels of 30 and 29 foot diameter. Brookwood Mine was similarly worked at this time entirely by water-power and in 1866 returned 1,440 tons of ore which realised £6,567. In 1868, however, it was decided to buy a 50 inch steam engine. The mines worked from various shafts: Martin’s Shaft, Engine Shaft, Pixton’s Shaft, Emma Shaft and Whim Shaft. The two mines continued in operation until 1877 and ranked as the largest copper producers in this part of Devon. Between 1861 and 1877, Brookwood Mine raised 20,719 tons of 6.25% Copper ore. Between 1856 and 1877, Wheal Emma raised 14,562 tons of 5.5% copper. Between 1880 and 1885, South Devon United raised 8,189 tons of 5.25% copper ore and 84 tons of mispickel. In the 1970s an attempt was made to re-work the Brookwood dumps for fluorspar but was not pursued due to the contamination of the fluorspar by copper ore. Being a large mine there are a lot of visible remains to see, including burrows, several large wheel pits and the remains of 2 engine houses. The best preserved engine house, housed a large pumping engine – the pump rod of which can still be seen in the shaft. The stack is set in the centre of the rear wall. The building probably housed the 50 inch cylinder pumping engine that Hamilton Jenkin states was bought in 1868. The boiler house, which adjoins the pumping engine house to the north, only hasits front wall remaining. An addition to this wall, that is marked by a sharp change in the stonework, suggests the engine was originally equipped with a single boiler and later on a second was added. 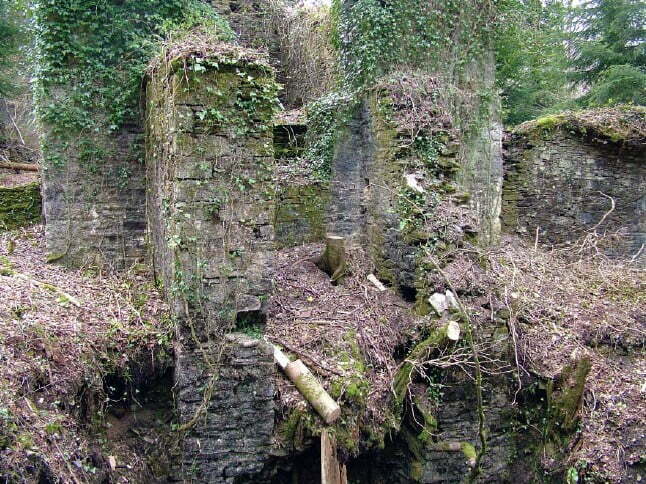 Although there is no record of any other beam engine at this mine, the ruinous house of a rotative engine with an attached stack strands nearby. Although the house has largely fallen, the crankshaft loadings and pits for the flywheel and possible winding drum are clearly evident. Although the stack is set to the side of the rear wall, little room remains for a cylinder opening and it is likely that the plug door served for this purpose. A boiler house, large enough only for a single boiler, adjoins the house to the north. Most research has been carried by Dr. Phil Newman – check out his awesome survey on the remains – HERE!